Universal Studios Orlando is quickly becoming a vacation destination where guests wish to stay a week rather than visit for a day or two. It is the second largest entertainment district in the Orlando area, second only to Walt Disney World. 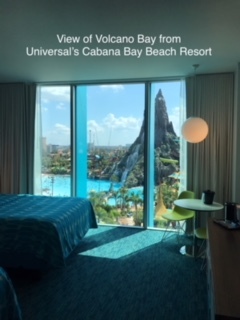 Universal Orlando now has three parks, Universal Studios Florida, Islands of Adventure, and their new water park Volcano Bay. It is also an easy shuttle or car ride from MCO, Orlando International Airport, making is a convenient location for all travelers. There are two premier hotels that offer the amenities one would expect at a deluxe level resort, but also have the perk of Unlimited Express Pass included for everyone staying in the room for each day surrounding the night of stay. This is a huge benefit as it saves a great deal of time waiting in lines and allows for more time to enjoy the beautiful resort. Resorts in this category are Loews Portofino Bay and Hard Rock Hotel. 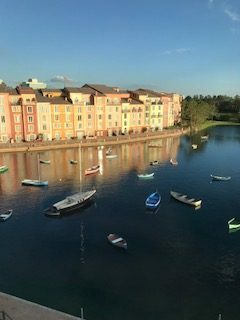 Portofino Bay is themed around the seaside village of Portofino, Italy. The theme is so well executed that guests feel completely transported from central Florida. There are also two preferred hotels on Universal Orlando’s property. Lowes Royal Pacific Resort and Loews Sapphire Falls Resort. These resorts are priced slightly lower than the premier hotels, but still offer an excellent experience in terms of luxury and amenities. Only Lowes Royal Pacific offers the Unlimited Express Pass with the room reservation and this is reflected in the slightly higher pricing. The prime value resorts feature affordable accommodations and fun for everyone. The two prime value resorts are Universal’s Cabana Bay Beach Resort and Universal’s Aventura Hotel which is scheduled to open in August of 2018. Universal’s Aventura Hotel will be very stylish and modern. It will be a high rise style building and offer views of much of Universal Orlando’s property. It will feel like a boutique hotel, but have 600 rooms which will make it another major hotel in Universal’s resort family. These resorts are arguably some of the most fun, luxurious, and well themed resorts in Orlando and beyond. If you are interested in staying in the middle of the fun on your next Universal Orlando Resort vacation, contact one of the expert agents at The Magic for Less Travel https://www.themagicforless.com/ or Magically Carefree Vacations https://www.magicallycarefreevacations.com/ to help get your vacation planning started! My name is Kelsey Lucardie and I am a travel planner with The Magic for Less Travel. I live in Ohio with my husband, three children, and many pets. I have traveled often to Walt Disney World since I was a child. I find Disney vacations to be unparalleled in terms of value, service, accessiblity, and fun. I am an avid Disney fan and love to keep up with the various resorts, parks, restaurants, and shopping available to guests.